Cancer children are the original free-range kids. They’re the dreamers of dreams who enjoy creating beautiful worlds from their rich imagination. Perhaps the most sensitive of the zodiac’s Water Signs, Cancereans can seem ‘not of this world’ because they one they make up is so much safer for one’s soul. In this, Cancer children are the ethereal sprites in our Earthly lives. They come out from under their Crab shell to play and dance in this reality but will scurry back into the safety of its shadows at the tiniest hint of discord. Not overly social, your little one is content with a good book or movie over the company of others. When he or she is with a group, don’t expect a leader. Initiative isn’t Cancer’s forte unless it’s something they come up with on their own. The Cancerian child is really difficult to get a read on. They don’t offer their feelings easily and are often shy and cautious, retreating into a protective shell. This happens because most children born under water signs feel things very deeply but don’t know what to do with all that emotion. It is going to take you some time to find a way to get them to open up without worrying about the resulting reaction. In terms of communication with mom and dad, be prepared for surprising candor. These children aren’t “yellers”. They deliver their message with calm coolness, but they are changeable. What they enjoy one day may not work on the next, and sometimes they just want to be alone. This is a normal protective response and a way that they can clear all the clutter in their minds. Many Cancer children gravitate to their parents and other adults because this offers greater security. Playmates can be thoughtless and every word hits your little Crab like a dart. Your love and compassion heals those wounds. Likewise you will find your Cancer child incredibly nurturing and caring. The Cancer zodiac child loves physicality and when you’re not feeling “just right” they will try to make things better. When this attention is misdirected the cancer child may get snippy, clawing on to the subject even more firmly. Even so, this will pass. Ultimately the family unit feeds the very soul of a Cancer child. They will always return to that focal point. What else can you expect from your Cancer child? Lots of tears. These water babies are governed by the moon. As a parent the key is determining what are the real deal and when they’re using tears as leverage. Throughout their life they will enjoy bright, lively colors, great food and affection. The Cancer child can be easily hurt, even with that hard outer shell. A little TLC from mom and dad readily fixes most of these situations. 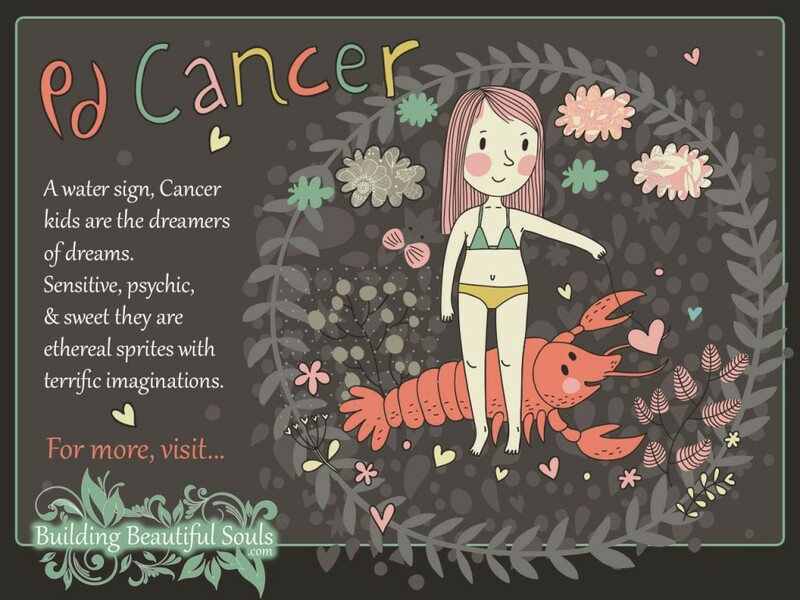 If you’re the parent of a Cancer girl then you’re likely going to really enjoy this experience. This star sign has a strong sense of compassion and a deep-seated craving for overall peace in the home. The only problem is that her emotions wax and wane like the moon. You’ll need a little patience in dealing with her, particularly in reading her changes in sentiments. While your Cancer daughter may trust you, her intrinsic personality dictates that she is very slow to trust people outside of her inner circle. She wants to find one or two people that she feels she can really trust. When faced with rejection, the Cancer girl readily retreats into her shell, needing an inner sanctum in which to heal. Particularly in younger years you’ll find your girl craving security. Some of the best ways to provide that is by having a consistent family routine and showing your feelings repeatedly. There is nothing impulsive about your baby. She thinks through everything down to the minutia. This doesn’t squelch her creativity in any way. You’ll find that your daughter loves all type of art ranging from photography and cooking to writing and dance. This is a great outlet for your Cancerian. Definitely encourage it! With all this love you might think that raising a Cancerian daughter is a walk in the part. Be aware, however, that they can be very stubborn girls. Once she puts down an opinion she will patiently wait for you to agree with her – as long as it takes! This has a lot to do with a distaste for any type of confrontation. They’d rather sit out the storm. The only time your daughter will actually fight is if they feel threatened (or they feel the family unit is in danger). When your Cancer girl reaches milestones don’t be surprised if she seems to disappear. Just like the crab, she need to shed the old shell and find something bigger, suited to the person she’s becoming. This period is very important to the Cancer personality. It’s when they process and adjust and then return to life with a whole new outlook. Your Cancer boy is rather shy and somewhat secretive. Sometimes it’s very hard for even an astute parent to read him. Even with family it takes time for your son to warm up to people. He’s smart as a whip and compassionate but he is strongly ruled by his emotions. When the Cancer boy feels something deeply all the facts in the world won’t matter. One of his more endearing personality traits is that on the home front you’ll find your son very thoughtful. He cares about his space and maintaining the peace. When the family fights, your Cancer son will be very unhappy and often retreat until the chaos stops. Even then when he does emerge he does so with caution. He will need reassurance and some quality time so that they do not feel rejected. Like a Cancer daughter order is very important to your son as are their personal possessions. He is not greedy, he just has specific tastes. This is one boy that you need to take shopping with you, not just pick out something on a whim. In terms of family dynamics, one of the Cancer boy’s more prevalent characteristics is that he has strong bonds with his mother and an intense sense of loyalty to the whole family. As with everything else in his life, however, this won’t always be obvious. Changeability is a Cancer’s middle name. More often than not your son is a home body. He likes close ties and a sense of security. He’ll gravitate toward people who show an interest in his family and situations deemed “safe”. His vulnerability attract people to him quite naturally, which is all the more reason for your Cancer son to take care in choosing friends. My little boy is a cancer. I wanted to post and mention just how much I love your website. It really is beautiful and gives so much in sight to these sweet souls, astrology is a beautiful thing! Would you have any advice regarding cancer sibling compatibility with either a Gemini or Sagittarius? I’m a Virgo mom of a 10 year old cancer girl. For the most part we are very close, and I love the bond we share but I worry about my loner cancer… she is so creative and intelligent and an independent thinker with her own innate sense of right and wrong, I don’t worry about her ability to be successful but I do worry about her happiness often…. sometimes she seems to be depressed… she almost never asks to have friends stay over – and she has zero interest in physical activities of any kind or sports or being outside, basically I wish I could find just one physical activity she enjoyed to encourage her to get moving and I worry her lack of exercise and fresh air is going to increase her depression and body image issues… am I being to “Virgo OCD” or is there a way to encourage my sedentary cancer child to enjoy getting more movement in her lifestyle? We’ve tried every sport, dance, swimming, the beach… she says she doesn’t like sports or the outdoors….